Yet, when we are focused on the past instead of the present, hope can be a seductive dead-end. “If only something in the past had not happened/or had happened differently, then my life now would be so much better.” If only the past were not the past. The seduction is in the approach: “If only” is a statement of hope. It feels hopeful and positive. If only [name any good thing] were true, then bliss/absolution/whatever. But the past has, of course, already happened. False hope always starts out feeling right, but crashes as it must on the rocky shore of reality. If we just believed hard enough in magic, then maybe the incantation of the if/then spell could finally work. We keep returning to hopeless hope, at least for the promise and the feeling of feeling hopeful. But as they say in AA, the definition of insanity is doing the same thing over and over again, expecting a different result. The cost of moving forward is this: we have to give up all hope of having a different past. Give up all hope of being luckier, of having a partner who didn’t cheat, of having a parent who was emotionally supportive . . . . We have to forgive all that, mourn the loss, and start over. Start over without that fantasy. Star over with nothing. Give up the shoes that don’t fit for no shoes. The prospect seems, well, hopeless. 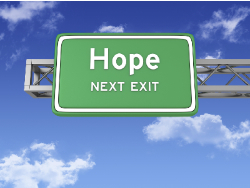 “Hope is the very least we need to keep going.” But let’s be hopeful about what comes next. Hoping for a different past is still hope, but if it changes nothing going forward, it’s just an old shoe, a drug of choice, a lie.